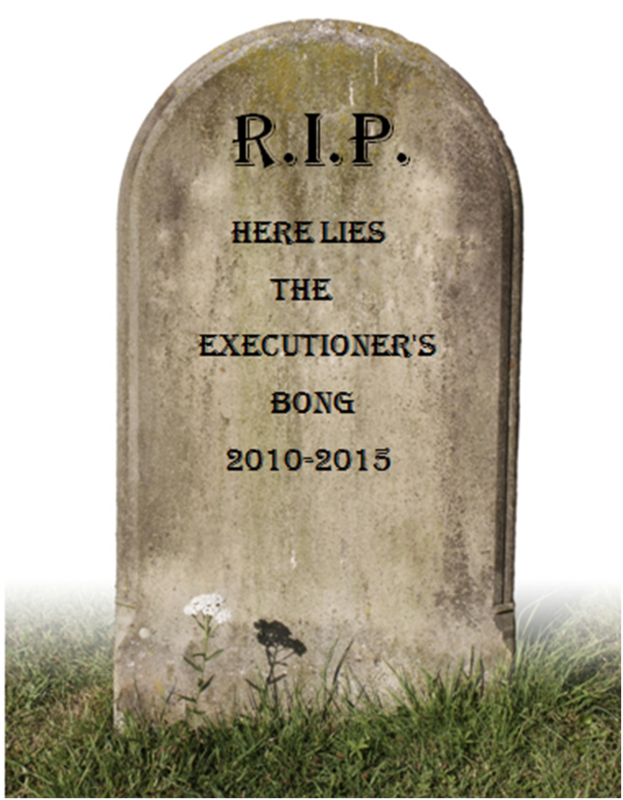 I’ve enjoyed writing The Bong for the past five years, however I’ve decided it’s time to call it a day. As per most of my posts to date, here’s a protracted epitaph when a couple of sentences would suffice. As the title of the blog suggests, the objective was never particularly serious or commercial, more so a recipe of cynicism, tactics, sneering and cavalier punctuation, and bizarrely it seemed to strike a chord with a wing of the toffee fanbase. Whether it be character assassinations, sopranos simile’s or haphazard tactical ponderings, it’s been fun writing. I’ve equally enjoyed interacting with fellow toffees via the blog, and speaking to them via Twitter, or in person in pubs and at the match. This been marvellous, which is remarkable given that I’m a very miserable man who generally avoids social interaction at all costs. I’ve been called all sorts along the way, like, (best one being “pseudo intellectual bullshitter”) but on the whole its been ace. Sometimes things just run their course, though, and I think it’s time to put the plug in the jug. Thanks again to all those who have supported and constructively interacted, and to those who’ve given me exposure to greater audiences along the way. In truth I’d probably have kiboshed it a year or so ago if it wasn’t for the positivity you’ve all thrown my way, so thanks lids. It’d be a fair assumption to say that RM’s pants have been pulled down in his last 3 tussles with opposite number Pochettino. In each contest the Toffees have lost, but it’s been the manner of defeat which has been more emphatic than the 1-5 aggregate scoreline to Spurs would suggest. Shots wise, we were out-gunned 45-28 over the 3 games, and on the ball Spurs had more effective possession, creating a stack more chances in open play (36 v 22). 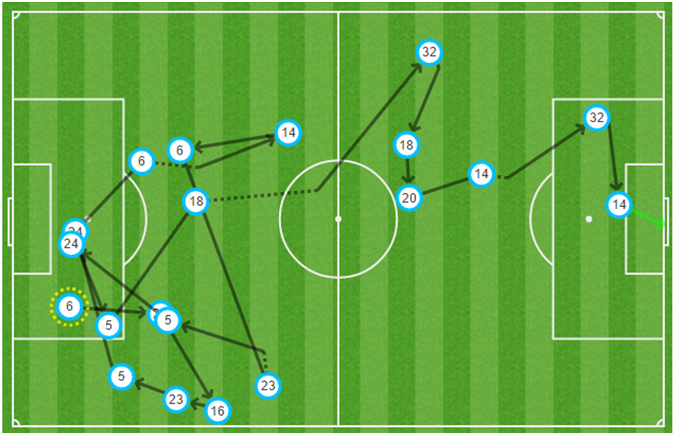 It’s been a similar tale of woe off the ball, with Spurs intercepting play 64 times to our 24. In short, we needed to up our game here to have any chance of getting a result. There was just the solitary change for us, with Bryan Oviedo returning in place of the injured Galloway at left back. Spurs started with Mason playing off Kane, with rather narrow looking support coming from Chadli on the left and Dembele on the right. Both sides were pretty much 4-2-3-1. The first ten minutes was all about Everton, with Kone the focal point of attacks as we collectively squeezed Spurs deep into their own half. The main out ball for this pressure was a direct one, from Howard to Kone, and the Ivorian was our star turn in this half, winning his keeper’s long kick outs to the right flank, holding up play and then linking with on rushing midfielders. Despite our early dominance, Spurs grew into the game and had the best chance of the half after Oviedo was outmuscled on the edge of the Spurs box. The impressive Mason was first to the loose ball, and pinged a cracking ball over the top of our backline for an offside looking Harry Kane to run onto. Luckily for us, the forward’s finishing has given off a more potent gust than his Lynx Africa sprayed boxies this campaign, and he again fluffed his lines badly, making a shocking first touch which enabled Howard to close the angle and make a smart save. Our only effort on target in the first half came from Cleverley after an error from Walker allowed him a 1v1 opportunity at Lloris that the keeper repelled fairly easily. Cleverley went off soon after with what appears a bad ligament injury, and was replaced by Kevin Mirallas. The first half was following a similar pattern to previous RM v MP games, with Spurs creating 9-2 chances in open play and off the ball regaining possession double the amount we did 28-14. In general one of the main reasons we’ve struggled against Pochettino is that his midfield has youth and legs aplenty; they can get in position well and all defend and control the space – at least defensively – really well. This means that invariably passing angles through midfield are blocked off meaning it was difficult for Barry and co to thread balls into Barkley. As the half ended we were again controlling the ball, albeit failing to get in behind a deep Spurs backline. Shortly after the interval Spurs were forced into a change when Dembele suffered another bad-looking knock. Pochettino moved Mason out to the right, and Alli central. The two injuries either side of half time probably benefited Spurs more than us, as without Cleverley we lost some control in the middle of the park with Mirallas – set pieces aside – hardly touching the ball. In contrast Alli gave Spurs a bit more penetration and zip to their attacking play. On the hour mark Spurs really started to turn up the gas with their share of possession shooting up to 70%, thus triggering a flurry of chances for the home side. The much maligned Barry, already on his customary yellow, was really creaking at this moment, with he and McCarthy struggling in the face of a high energy, free fowling, midfield pressure triangle from Spurs. The home side were making gains down our right side, and in particular through Chadli, who created the most chance in the game. Firstly, after a gaffe from Barry, Mason forced Howard into a point-blank stop. Then, Before you could say STITCH THAT MOWEEINIO YA SEAT SNIFFING QUEG, Spurs had another chance, with Alli firing a wayward effort after Jagielka and Barry had failed to clear their lines. 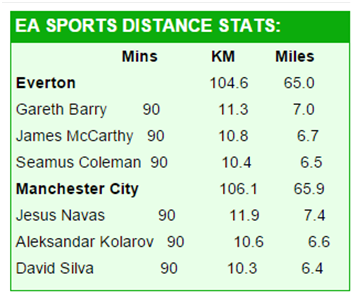 Whilst he struggled at times, Barry still recorded the most distance covered of any player on the pitch, maintaining his 100% record this season. 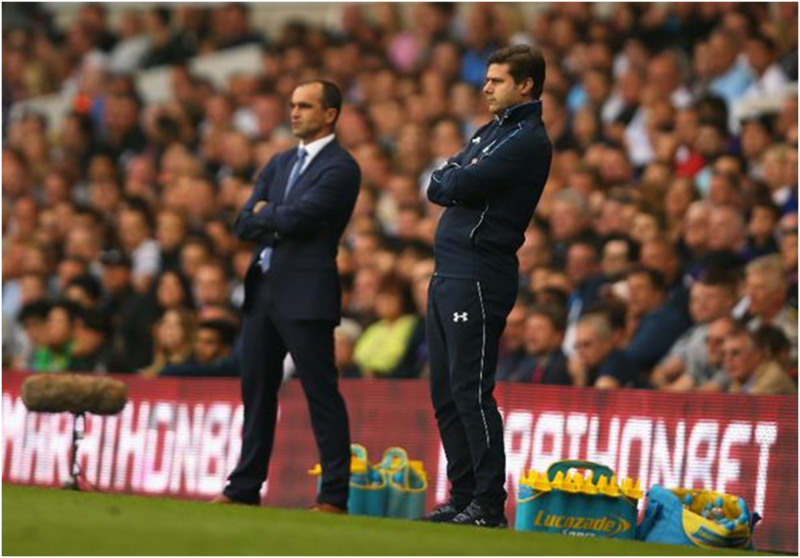 Credit to Martinez here, as he made a change which took the sting completely out of Spurs. Lukaku had for the most part toiled and spent most of the second period berating the service being played into him down the right, so it wasn’t a big surprise when the more industrious Nasimith replaced him. The ex-Rangers man was only on the field for a short period of time, but his niggling, snide factor enabled us to win 3 free kicks (Lukaku had won 0 before going off) in the Spurs half and stemmed the tide which had been building before he entered the field. 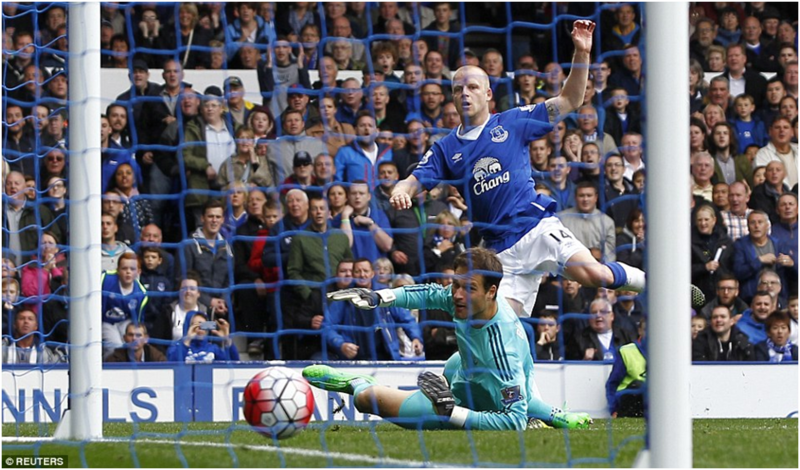 The Toffees could have even have nicked it late on, when Kone diverted Oviedo’s cross inches wide of Lloris’ goal. Few would argue that Spurs created the better chances, and the game in general followed the usual Martinez/Pochettino flow, but fortunately not the usual end result. It’s a really useful point for us at a ground we have struggled to get anything from in recent years, although our lack of attacking thrust, now shorn of the impressive Cleverley, will give Martinez a few headaches ahead of the looming transfer deadline. There was no personnel changes and one positional change for the home side. Perhaps wary of the threat City carry down the left, Cleverley swapped flanks with Kone, seemingly with a brief to stub out Kolorov and anyone else drifting into his corridor of uncertainty. 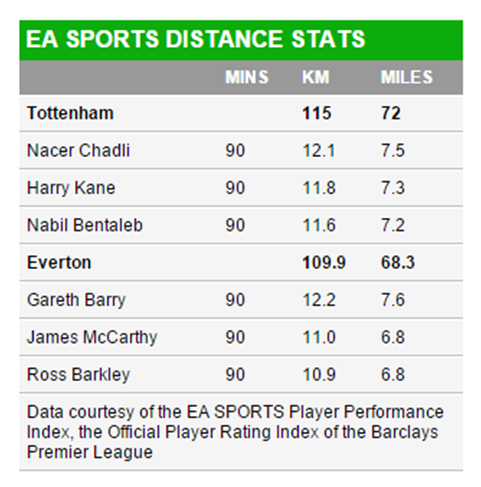 It was pretty much a flat 4-5-1 with Barkley the closest support to Lukaku. The Citizens were also unchanged from last week’s demolition of Chelsea, lining up in a 4-2-3-1. The approach from Martinez was less direct than last week’s South Coast beano, presumably due to the physical advantage City had on us with Kompany and co. Rather than last week when Howard tried to get the ball forward as quickly as possible with his kick-outs to Lukaku, the preference here was to slowly develop play out from the back, notably down the right flank with Coleman via Stones and McCarthy. The approach yielded mixed results. Adversely it meant that often the service into Lukaku was slower, and for the most part the Belgian was well contained by his marker, the much maligned Mangala. Arguably our most threatening moment of the half came when Howard decided to lump one, hoofing a first time punt towards Lukaku, His flick allowed Cleverley to arrow in on goal, only for his enterprising surge into City’s final third to be halted illegally by Fernandinho, who was doing a good job of covering his back four and his fullbacks in particular. From the resulting free kick Lukaku skimmed the bar which, along with his disallowed goal, were our closest calls of the half. It was certainly more of a submissive home display than usual, focused on retaining shape and making it hard for City to play through us. In the first half it worked to a point in that we were competitive and still in the game at 0-0, although by then our visitors had carved out enough clear-cut chances to be at least one up. The stand out chance ended in Howard making a smart save from Aguero after Silva had drifted over to our left side to combine well with the tireless Navas. This chance was a result of City’s focus down their right, with inexperienced third choice left back Galloway not exactly being ably supported by Kone. As good as the Ivorian was in our opening two games, here he was more of a liability from a defensive standpoint, and one bizarre dribble 20 yards from his own goal could have cost us dearly. After the break Silva ominously began to drift more and more to our left flank and influence the contest both on and off the ball. His focus was to exploit the spaces vacated by marauding surges from Coleman in order to create overloads with Sterling/Kolorov. With the after-taste of the half time mellowbirds still fresh in Howard’s mouth, Silva had already struck the American’s post with a stinging drive. The imperious Spanish schemer is well-known for his majestic jinking, but his Machiavellian off the ball game management (cheating in English) regularly goes unnoticed. If you’re unsure, watch the game back and see his full repertoire of snidey pulls, off the ball blocks and one particular tug (ooh err) on young Barkley. As a fellow snide – minus the football ability – this should be applauded. Anyway, back to the game, and here’s where the wheels sadly came off for the tricky blues. Unsurprisingly, Silva’s two most frequent pass combinations were to City’s wingers – to Sterling (14) and Navas (10) times respectively. You know what the threat is with this cat, but dealing with it is an altogether different proposal. 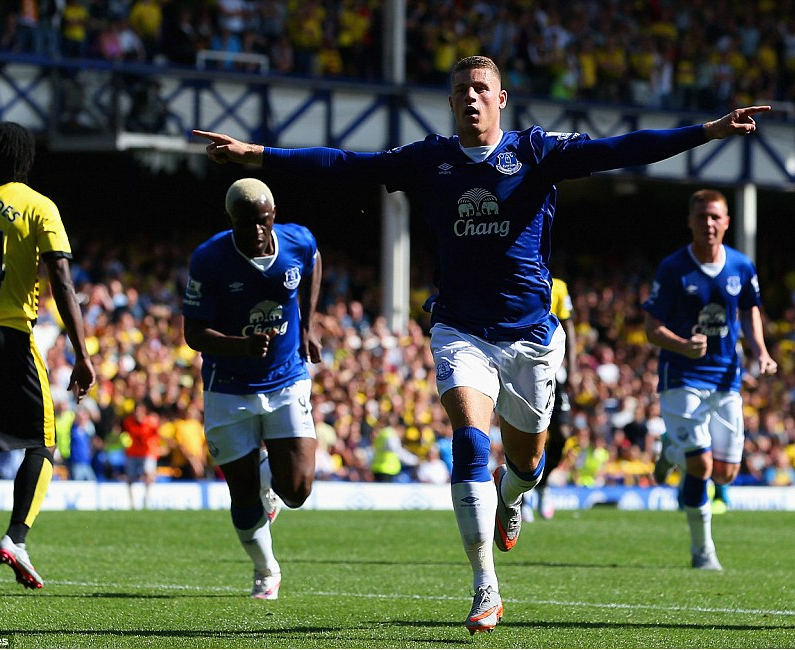 The first goal came after Barkley threaded a pass to McCarthy 20 yards from City’s goal. The Irishman’s touch was heavy, and this allowed City to regain possession and break down our right flank. Silva played a nice one two with Sterling who then threaded a splendid pass through a poor defensive line -with Jagielka playing the Kolorov onside – and the Serbian duly broke the deadlock. It was a moment of woe for Tim Howard, criminally beaten on his near post when presumably expecting a pull-back by Kolorov rather than a shot. Given that we’d created minimal in City’s danger zones, the goal felt like a terminal blow. Martinez made changes to the shape and personnel, but apart from a Barry header there was limited tangible outputs. With the game now stretched, another Silva inspired counter attack led to Navas stinging Howard’s gloves with a fizzing drive which the keeper repelled into touch. From the resulting throw, Nasri played a one two with the otherwise well shackled Toure, before deftly lobbing the keeper sooner than you could say JUST STARFISH HIM YOU PILLOCK. The keeper had a decent game, but it was completely undermined by these two gaffes. Few would have any complaints that City deserved the win, in what was an impressive display by the season’s early pacesetters. Martinez always seems to be caught between two stools with City; he’ll be cautious whilst never going Moyes uncut, and instead he’ll try to create and give them a game. The result is that we aren’t tight enough defensively and at the other end lack the numbers / craft to open City up. It wasn’t a bad display, though, and positives included the displays of Barkley and Cleverley, however in general there was a lack of cutting edge as was shown by the shots on target count, which was 1-9 in City’s favour. Luckily we won’t have to play sides of this quality every week, and attention will now turn to recruitment and trying to plug a couple of glaring gaps in our attacking arsenal before the visit to Spurs. 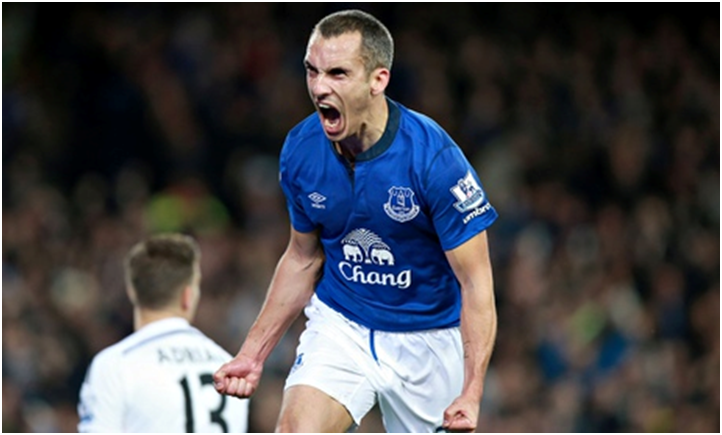 After the doom and gloom of last week and the ensuing hysteria this week, Everton brushed aside their troubles to deliver a pretty much faultless spanking of Southampton. 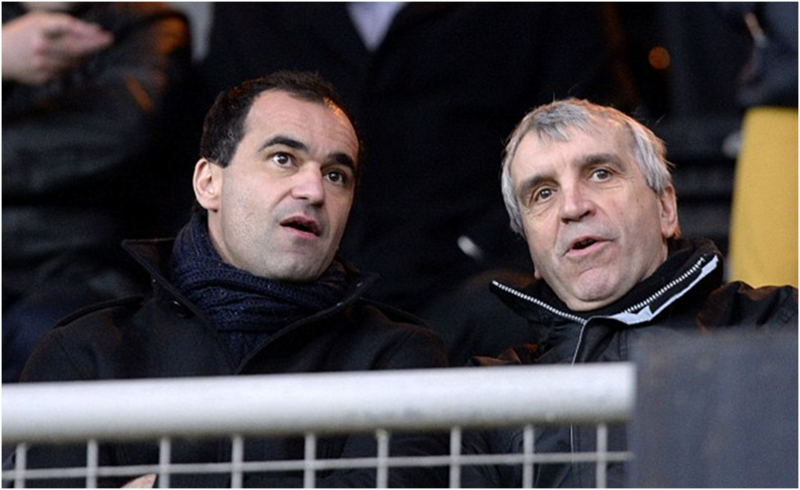 Roberto Martinez made 1 change from last week’s line-up, with Arouna Kone coming in for Kevin Mirallas. On first inspection Kone was deployed as a right-sided forward in a multi layered 4-1-2-2-1 type setup. Yep, that formation probably doesn’t exist. Setup wise, Barry was deployed more centrally in front of Stones & Jagielka, McCarthy was towards his right with Cleverley hugging the touch-line a bit more on the left. 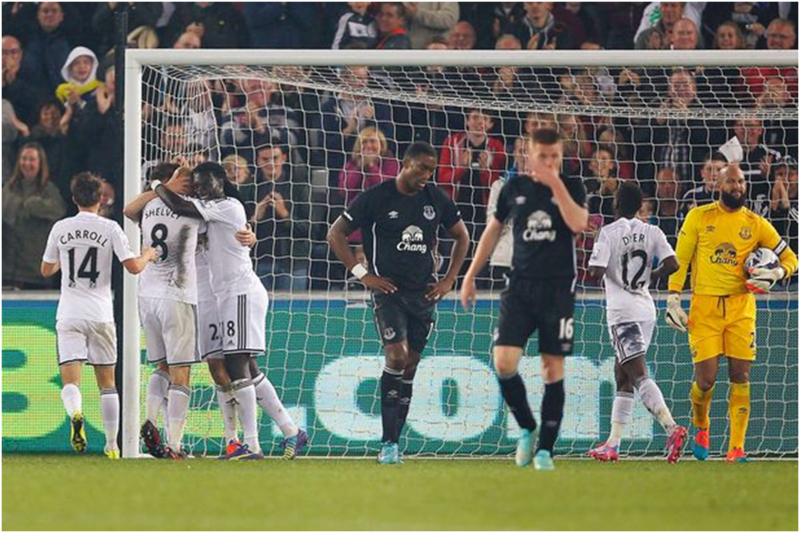 In front of them Barkley (inside left) and Kone (inside right) played as narrow support behind Lukaku. 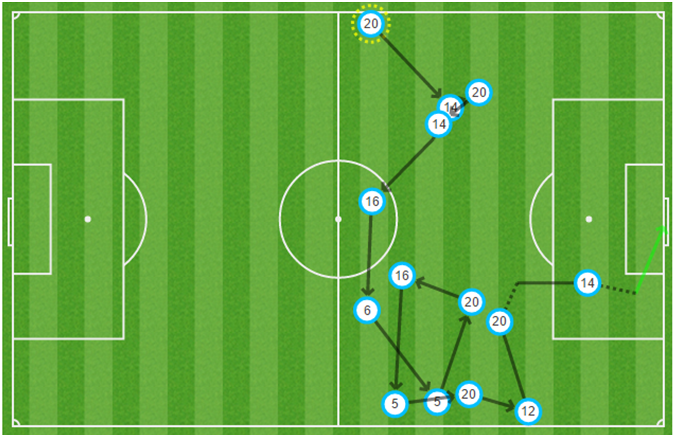 Martinez was banging on about lines of passing on MNF this week, so you get the picture. The Saints made one change, with Shane Long attempting to break the most goals scored against Everton for different mediocre clubs record, from the left of midfield in a 4-2-3-1 ish setup. One of the most obvious tweaks to our approach based on the evidence of the opening couple of games of the new season is how we’ve gone from back to front a lot more quickly than we did on average last season. Indeed, we’ve attempted more long passes than any side in the league apart from West Ham, and made the most accurate (66). The usual tactic when Howard gets the ball is for the centre backs to split and for Barry to come in between and receive the ball to link play to the midfield/forwards. 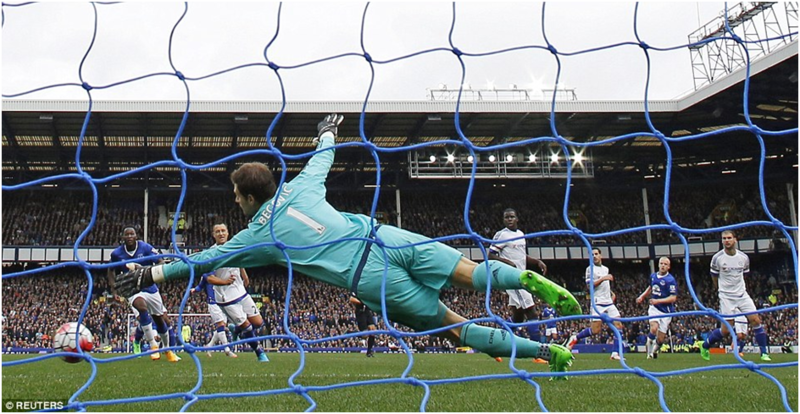 Yesterday this rarely happened with Howard opting to go direct, straight into Lukaku (albeit with haphazard results). The ‘Big Belgian’ would then look to link play with Barkley – which he did brilliantly – with the Lukaku-Barkley pass our most frequent of the game. For the first half this was the main outball, with Barkley then able to make short, forward passes into the feet of midfield runners Cleverley and McCarthy. He did this superbly, albeit the spaces between Southampton’s defensive and midfield lines were wider than Sammy Lee’s head. Martinez is often criticised for advocating sterile possession in our own half, but here our play was predominately in the danger zones, and we posed a genuine threat every time we broke forward in numbers. 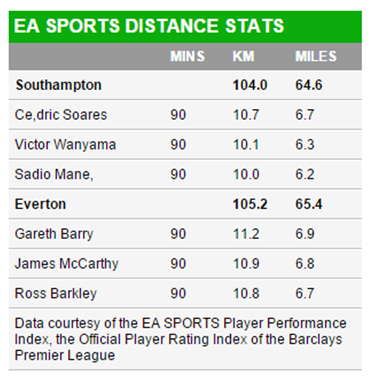 Barkley in particular was in the mood, and had more touches and passes than anyone on the pitch, and crucially more of his passes came in the Saints half than any other Everton player. He was also involved in both our first half goals, both of which, like him, were ace. The opening gambit came from a goal straight out of the mythical counter attacking manual. Southampton will probably reflect that they should have had 2 rather than just the 1 man on the edge of our box when their corner comes in, but what ensued was sublime from Everton. As the ball broke loose, Barkley marauded, fed Kone down the right, and the Ivorian’s sublime, pin point cross was deftly despatched by the head of Lukaku. The sight of Cleverley and Galloway both busting a gut to get on the end of Kone’s cross was testament to the numbers and desire we put into such transitions of play. After Barkley then missed a sitter after being put in from Lukaku, the resurgent youth then returned the favour by expertly slotting in the Belgian, whose crisp shot was swept into the net first time. Lukaku actually won the ball back at the start of this move in his own half, and it was typical of the pressure game we were sticking up the Saints at this point of the game. 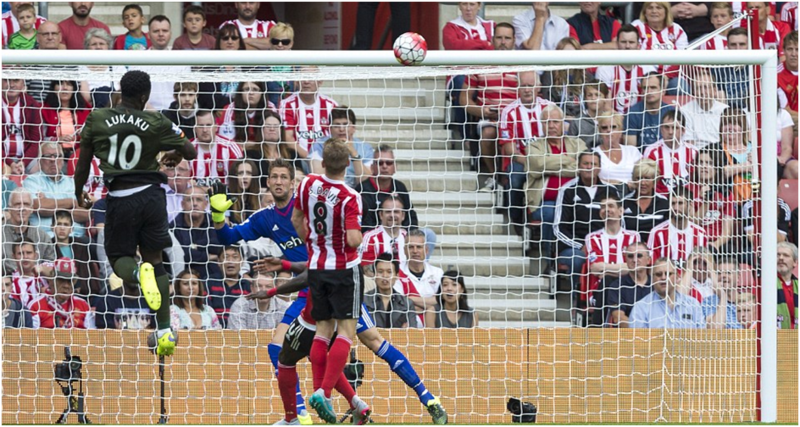 The term unplayable is banded about haphazardly, usually by morons like Robbie Savage, but in this instance it was on the money; Lukaku’s pace and power to gallop into the wide meadow of Southampton’s defence, allied to some ruthless finishing, was a joy to watch. Southampton changed things at half time with Romeu coming on for Tadic, presumably to get a bit more control in the middle of the park where the battle had been emphatically lost. Romeu was tasked with adding some bite and retention to the centre of midfield alongside Wanyama with Davis a bit more advanced. Mane moved to the right and Long swapped over to the left. The result gave Southampton more control in the middle of the park, but our defensive operation was so resolute that it was rendered futile. Martinez re-shuffled the midfield and went to a 4-3-1-2 after the break with Cleverley forming part of a flatter midfield 3 (on the right side) with Barry left and McCarthy central meaning it was a 3v3 in the centre of the park. 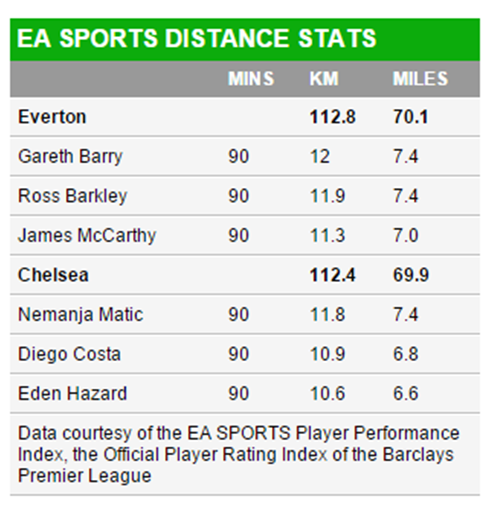 Barry covered the most distance for Everton for the second game on the spin. With the middle ground compact, Saints were forced down our left flank and resorted to pumping in an avalanche of crosses (39) into our box. Whilst we dealt with such situations abjectly in the corresponding fixture last season, this time we held firm with the backline and Stones, or Chelsea target John Stones as he is now known, repelling the aerial onslaught of groc-chic Pelle superbly. With the game fizzling out somewhat due to this midfield stand-off, the superb Barkley was to have the final say with a wonderful right footed strike following good work from Lukaku and Coleman. The big question mark over Barkley last season was his poor yield little of assists / goals for someone playing at the sharp end, so to follow-up his goal last week with his first goal/assist combo in the same game was a real sign of progression. The control of the game and counter attacking threat Everton carried in the first half was too much for Southampton, and likewise our rigidity and shape nullified our hosts and shut the game down after the break. The performance of Barkley was the most eye-catching, and his link up with Lukaku will give Evertonians a huge shot in the arm of what could be in store for the rest of the season. A hangover and a burnt head were the only tangible outputs to be taken from Roberto Martinez not-so-new-look Everton’s customary 2-2 opening day draw. The big pre-match news was regarding Leighton Baines, and the ‘hammer blow’ that our key creative outlet will miss the start of the new season due to injury. In his place Martinez opted for centre back Brendan Galloway rather than the like for like width of Bryan Oviedo, with the backline otherwise as you’d expect. In midfield, as per most of last season, we were again without our principal ‘3 wise men’ with Gibson and Pienaar injured and Osman only fit enough for the bench. This meant that responsibility for curing the creative void rested with debutant Tom Cleverley in the left-sided midfield spot, although he often shifted inside to enable us to go from 4-2-3-1 to 4-3-3. 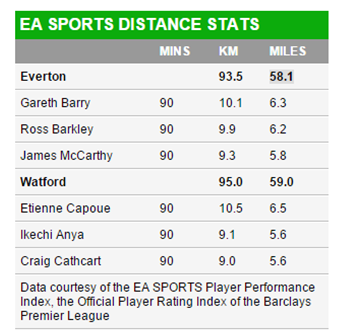 Messrs Barkley and Mirallas made up the numbers as the more advanced support to Lukaku. Six of Watford’s nine summer buys were defensive minded players, and new boss Flores approach appeared a tad more conservative to the gung-ho approach that secured promotion last season. The Spaniard setup in a 4-4-1-1 with Deeney supported by journeyman schemer Jurado. The opening credits to the 2015/16 season were nothing short of a total shambles as the chosen ones endured 45 minutes of utter woe, and were lucky to still be in the game by the interval. Its difficult to know where to start with this latest mess, but one of the major subjects of irritation was the sluggish passing from back to front, and the non existent service trickling through to a half-fit Lukaku. The absence of Baines was certainly not helpful here; the left back offers our best outlet of service on the ball from defence into the forwards, usually providing double figures per game for passes into Lukaku. His replacement Galloway did nothing wrong, but as an inexperienced centre back it isn’t really in his nature to ping angled passes into the attacking players, or for that matter to steam forward and offer width to the attack, and this was underlined by the fact that he made no passes into Lukaku in the 60 minutes he was on the pitch. With Coleman intent on dribbling the ball out of play on the other flank, there was precious little in terms of output from the backline to support midfield and attack. This was in stark contrast to the way Watford used Deeney at the other end of the pitch. 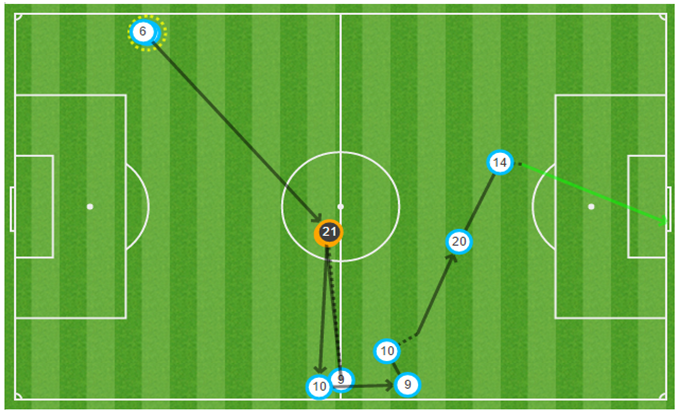 The supply line for the Hornet’s chief groc came from the impressive Holebas at left back, and from the gargantuan deliveries from Gomes in goal, who combined to play 20+ passes into the big forward. Deeney was then able to link play with the likes of Jurado and Anya, with Watford making significant gains down our right flank early on. Before the break Watford’s greater purpose and penetration was rewarded with the opening goal, as Layun pinged home after Jagielka’s rash clearance from Jurado’s cross. The 1-0 half time lead was the least Watford deserved, and with their disciplined, rigid two banks of four keeping us firmly at arm’s length it was clear that changes were needed if we were to get back into the game. The second half started in a similar manner, with Watford holding firm and any forward momentum for us being checked by Lukaku’s poorly timed runs, leading to a flurry of offside calls in our opponent’s favour. The forward only really had one sniff of goal all afternoon, but failed to move his feet quickly enough after an excellent centre from Barkley shortly after the break. In response, Martinez rolled the dice and to his credit the changes made helped galvanise Everton to get back into the game in what was – at least in an attacking sense – a much improved second half display. The Catalan’s key switch was to introduce Arouna Kone, who came on to replace Brendan Galloway. The resulting reshuffle meant that Gareth Barry switched to left back and Ross Barkley dropped deeper, allowing the Ivorian to join Lukaku and Mirallas as the attacking triumvirate. Barry’s lack of speed is obvious, but his move to left back increased the quality of pass from the backline, and enabled us to get the ball forward quicker to Lukaku, who looked more of a threat with Kone now supporting him. The much maligned ex Wigan ‘hitman’ isn’t anywhere near as bad as people make out, but its unquestionable that he has struggled to make any real impression since signing 2 summers ago. Here, however, his impact was immediate. Firstly he could – and probably should – have dispatched a header after a superb, pin-point cross from Cleverley down the right flank. After more good work from Cleverley, this time to pick the odious Behrami’s pocket, Coleman swung one in for Kone to contest. The sub controlled well was able to play a nice cushioned pass onto the right boot of Barkley, whose fourth shot of the game was emphatically dispatched, driving the ball high into Gomes net. Rather than turn the screw on our now stuttering opponent, another defensive gaffe, this time from Stones, was to put us right back to square one. After Gomes thundered a trademark massive throw downfield, Deeney was able to link with Ighalo who then cooly sidestepped rash lunges from both Stones and Jagielka to drive home from 20 yards. 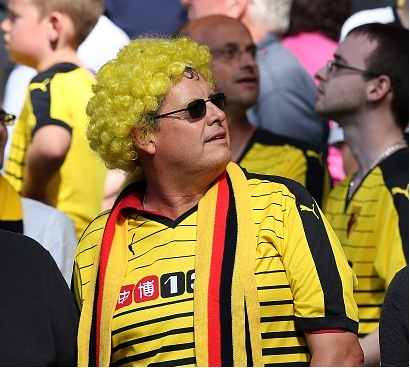 Watford’s display had been excellent, and was only blighted by their west brom-lite ‘were gonna bounce in a minute’ bantz fest in the stands, an early shot across the bow to Villa in the funster stakes. Sadly for the Hornet’s jesters there would be a sting in the tail, and, before you could say fuckoffeverton, the swaggering Kone would have the last laugh. After another good long pass from Barry down the left, the weary Lukaku was able to tee-up his strike partner for a splendid right footed, angled finish past Gomes outstretched right arm. Many will look at this campaign as the true barometer of Martinez. Is he the tactical messiah of his first season or the muddled mess of the last campaign? The answer probably lies somewhere in between, and this game did little to confirm or dispel either argument. Starting Galloway was a weird call for me, particularly given that we had no real out-and-out winger on the pitch to provide width to attacks, something that will hopefully be remedied by the return of Deulofeu and, possibly, Lennon. At the back we looked ragged and slow in possession, in midfield McCarthy was clearly rattled by arch-snide Behrami, and upfront Lukaku was well shackled by Prodl and Cathcart for the most part until Kone came on. Martinez did show that he can influence games from the bench with his changes, however, and he will be hopeful that new blood, allied to the resurgence from Barkley/Kone and the enterprising display of Cleverley, can help us swiftly move on from this disappointing encounter.